AUSTRALIA might be heading for another plebiscite - this time to test support for an Australian republic, Prime Minister Malcolm Turnbull said today. 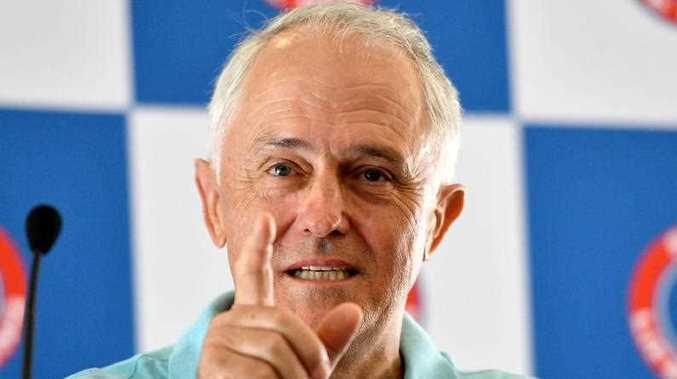 Speaking at Sydney's North Bondi Surf Life Saving Club, Mr Turnbull said a plebiscite or postal survey would be a way to kickstart debate ahead of a binding referendum on the matter, if Queen Elizabeth's reign happened to end during his term as PM. According to The Australian , Mr Turnbull, a staunch republican who led the failed 1999 referendum, said it was pointless "pretending that there is an appetite for change when there isn't one", but that a postal survey could serve to reignite the debate. "I think the first thing that you would need to do is to have an honest open discussion about how a president would be elected ... (and) whether the president would be chosen by parliament in a bipartisan two-thirds majority - as proposed in '99 - or directly elected," he said. "That is the rock on which the referendum foundered in 99. You've got to have that discussion and you know it may be that a plebiscite - maybe even a postal survey given the success of the marriage postal survey - could be one way to deal with that. "But that issue needs to be debated and resolved and then of course the fundamental question - then you've got to put up an amendment to the constitution which proposes a president to replace the Queen as head of state and then it's up to the Australian people to decide. "This is not a change that parliament can make, and Australians have shown themselves to be very conservative when it comes to constitutional change." The PM added: "We all say long live the Queen and we say that with great sincerity and love." Mr Turnbull's comments were welcomed by Australian Republic Movement chair Peter FitzSimons. "We are thrilled with the return of the PM - long the most passionate republican in the country - to moving forward the process of becoming a republic," he said. "The leaders of both sides of politics clearly want this to happen ...[it's] not a question of if, but how. "Yes, there will be opponents, but I actually think the idea that, 250 years after Captain Cook landed, Australians coming together to work out the final step to true independence beneath the Southern Cross - as enjoyed by the First Peoples - will be a wonderfully unifying exercise, and precisely what the nations needs." But former Prime Minister and fellow republican Paul Keating told The Australian Mr Turnbull had "no policy ambition" and attacked the current PM for his lack of leadership on the issue. "He has little or no policy ambition and commensurably little imagination, no system, of prevailing beliefs ... Was (his republicanism) just Malcolm being another chameleon doing another chameleon act as he has on so many other things?" Mr Keating also criticised former PMs John Howard, Kevin Rudd, Julia Gillard and Tony Abbott for failing to advance the cause while they held the top job. Unsurprisingly, Mr Abbott couldn't resist both defending the monarchy and sticking the boot into his struggling rival following Mr Turnbull's comments.